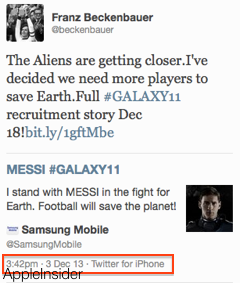 A global ad campaign to promote Samsung devices, involving soccer stars and an alien invasion story, instead revealed that the fantasy campaign's star manager Franz Beckenbauer tweets from his iPhone, not a Galaxy device. 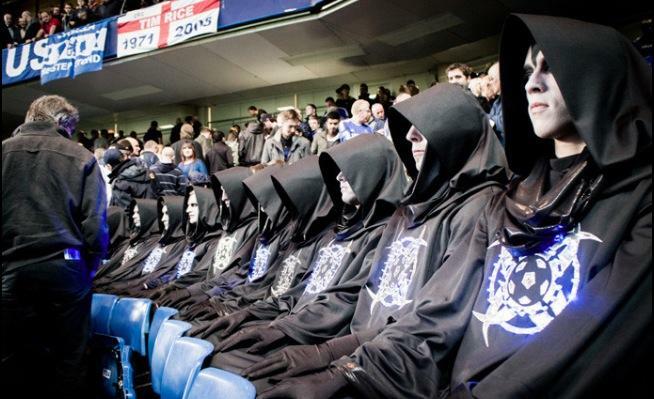 Just over a month ago, Samsung launched its secretive ad campaign by seating actors in black robes at Chelsea FC, Bayern Munich and Juventus FC soccer games (that's "football" outside the U.S.). The company also financed billboards with secretive symbols and the hashtag "WinnerTakesEarth." Samsung then recruited internationally famous soccer legend Franz Beckenbauer to serve as the manager of the company's "Galaxy 11" fantasy team, along with captain Lionel Messi, a Argentine footballer. Samsung has previously sponsored soccer teams in Europe, South America, Asia and Africa. 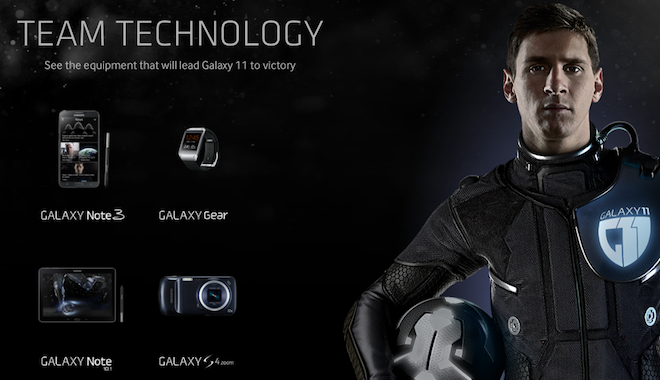 The company announced in November that it would be revealing "the story of Galaxy 11," involving a soccer players taking on invading aliens, as a "series of chapters over the coming months and brought to life across Samsung's GALAXY devices, online platforms and social media channels." Younghee Lee, Samsung Mobile's executive vice president of Global Marketing stated, "through this one-of-a-kind campaign, Samsung wants to combine fans' universal love for football and GALAXY devices. We hope that this campaign stimulates our fans' imagination and inspire engagement." However, the campaign hit a snag when Beckenbauer, the legendary leader of its fantasy team, tweeted out the next segment of the story from his iPhone. Once noticed, metadata tag was removed. Sending promotional tweets about other products from Apple's iOS devices seems to be quite popular. In October, T-Mobile chief executive John Legere intended to use Twitter to direct attention to Samsung Mobile's latest Note 3 phablet, but inadvertently did so via his new iPhone 5s. He then sent out a photo claiming to carry both an iPhone and a phablet and the Gear watch. His photo (below) showed the Samsung phablet on its lock screen, plugged in to a power adapter, with a generic carrier background wallpaper image. His iPhone was logged in and appeared in active use, with pending phone, email and Facebook notifications. It also had multiple pages of apps installed and a personalized background photo. Last year, Oprah Winfrey used an iPad to send out tweets endorsing Microsoft's Surface, using the hashtag "#FavoriteThings" to say she had bought a dozen of them for Christmas gifts. After BlackBerry paid Alicia Keys to serve as its Creative Director, she sent a personal tweet from her iPhone in February, then removed it and claimed her account had been "hacked." In March, after the Chinese government's CCTV propaganda channel began airing reports stating that Apple was "biased against Chinese consumers in its warranty and customer service policies," a series of orchestrated tweets on China's Sina Weibo from various celebrities and other well known personalities voiced unison disapproval of Apple on cue after the broadcast, many of which were sent from iPad and iPhones. 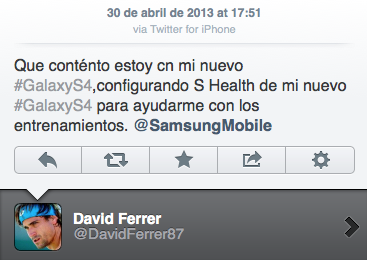 Shortly afterward in April, Spanish tennis player David Ferrer tweeted his satisfaction with his #GalaxyS4 and that he was "configuring S Health on my new #GalaxyS4 to help with training @SamsungMobile," all via Twitter from his que contento estoy con mi iPhone.